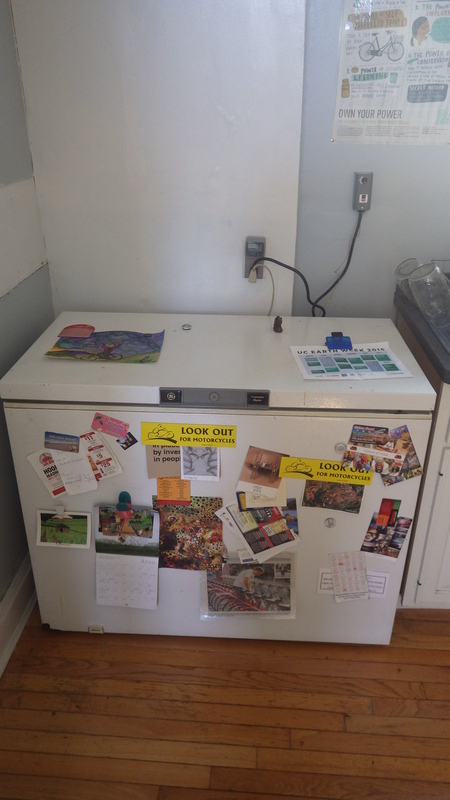 Soon after I posted the first blog about refrigerators my dear friend Dawn who works at Hostel in the Forest located in Brunswick, GA shared a link about how the hostel has tackled the problem of refrigeration. And wow, has it really worked! In short, by substituting one’s fridge with a “converted” chest freezer we’ve been able to significantly reduce our electrical consumption. ‘Why a chest freezer, Robbie? Also, how did you “convert” your chest freezer?’ Well, I’m glad you asked. First, chest freezers are designed to maintain a colder temperature so they are generally better insulated. Second, when I open my regular ol’ fridge all that cold air spills out of the bottom. Then, hot air rushes into the top. The air in the top of the fridge must be cooled down which makes the fridge run more often. When I open my chest freezer, the cold air just chills (pun intended). There is very little air exchange which doesn’t cause the chest freezer to run near as often. 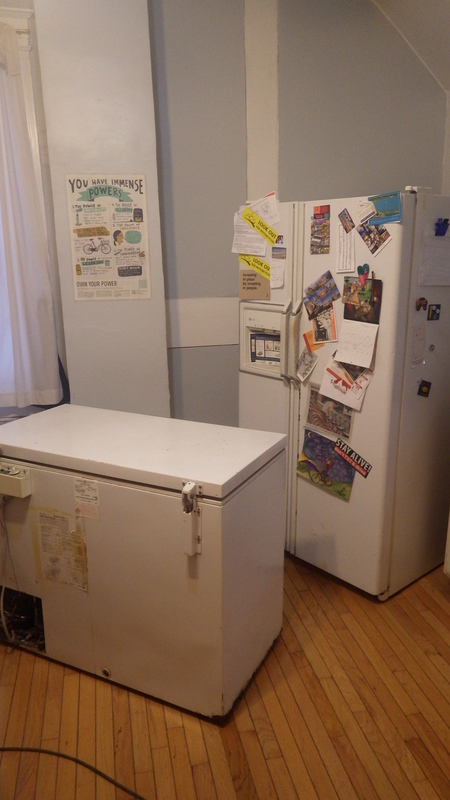 Third, in this particular experience our chest freezer is smaller than our refrigerator which also saves energy. 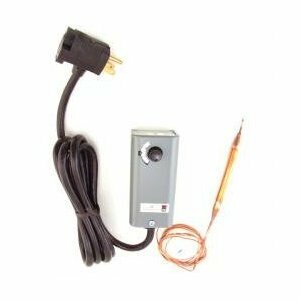 Place the thermocoupler into the chest freezer and plug the thermostat into the wall. Then plug the chest freezer into the thermostat’s outlet. Set the temperature (ours is at 35F). The thermostat switches the electrical flow to the freezer on and off according to the freezer temperature. So, when the freezer gets above 35F the thermostat allows electricity to flow to the freezer and the freezer switches on and runs. Then when the thermostat senses that the temperature is below 35F, it turns off. In essence our freezer is now acting as a fridge. It’s really that easy. ‘But really, how much energy are you saving?’ Another good question. 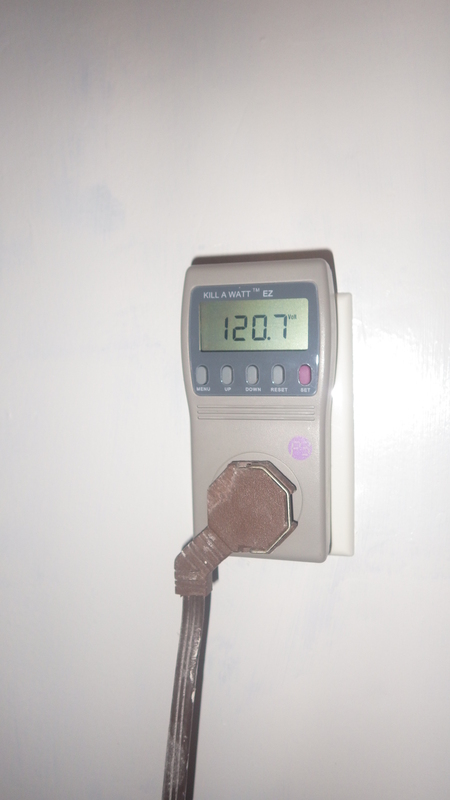 According to our kWh meter, the fridge was using 1400 lbs of coal per year. Our chest freezer uses 110 lbs of coal per year. That’s 12 times more efficient than the fridge. 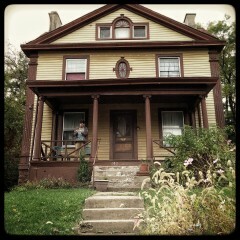 In terms of dolla’ dolla’ bills being spent, our fridge was costing us roughly $200/year. The chest freezer will cost us about $20 per year. So, the lesson is that even if you hate the environment it can still make sense to switch to this set up which we’re using and save $180/ year on your electricity bill. A big thanks to Dawn for providing us with the information and another big thanks to Tabor for delivering the chest freezer! A live-action shot of the ‘Kill A Watt’ monitoring our electrical usage. Looking comfy in the kitchen.